Defence Force poacher Devorn Jorsling snapped a five game scoring drought with a second half winner last night, as the Army/Coast Guard combination edged Police FC 3-2 at the Hasely Crawford Stadium to revive their chances of snapping one of two available 2017/18 CONCACAF Champions League qualifying places. Photo: Defence Force striker Devorn Jorsling (right) holds off a Police FC defender during Pro League action at the Hasely Crawford Stadium on 3 May 2016. Jorsling scored the winner as Defence Force won 3-2. After his simple headed finish from close range, Jorsling celebrated by a leap onto the giant foam mat used for pole vaulters at the northern end of the ground. Time will tell whether Defence Force has a similarly comfortable landing at the end of the season but this result, which lifted Defence Force to second place with 45 points, must have helped. 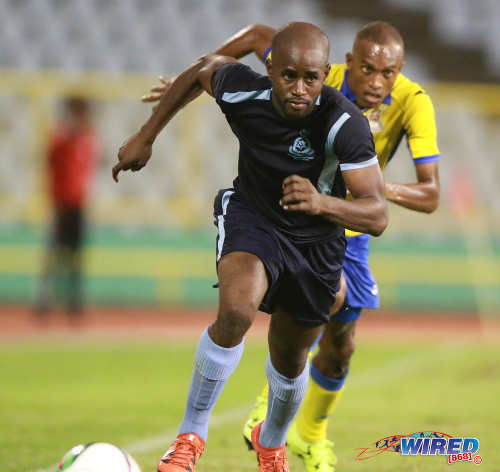 Defending Pro League champions, Bankers Insurance Central FC, lead the standings with 52 points and, with three matches remaining plus a game in hand over Defence Force, are within touching distance of retaining their title. 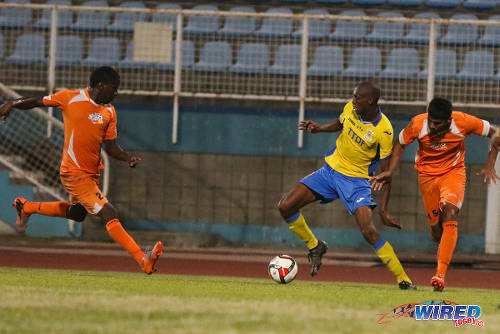 On Sunday, Central, fresh from successfully defending their Caribbean Cup title against W Connection in Haiti, can wrap up the title with a win over Japs North East Stars from 4 pm at the Mannie Ramjohn Stadium in Marabella. But Stars versus Central is anything but a foregone conclusion. 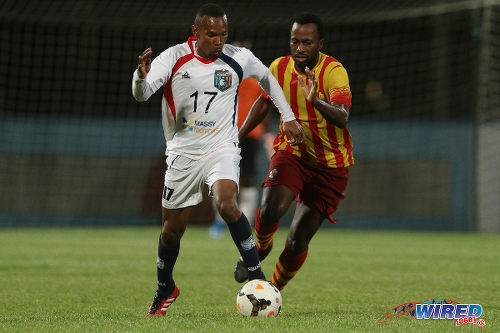 Last night, Stars, who are led by former Central coach Ross Russell, cruised to their seventh successive Pro League win, as they whipped Morvant Caledonia United 3-1 in the first game of the Port of Spain double header. Once again, revitalised poacher Kerry Baptiste led the way with a double—his fourth and fifth goals in his last three outings—as Stars proved too clinical for a largely uninspired Morvant Caledonia outfit. 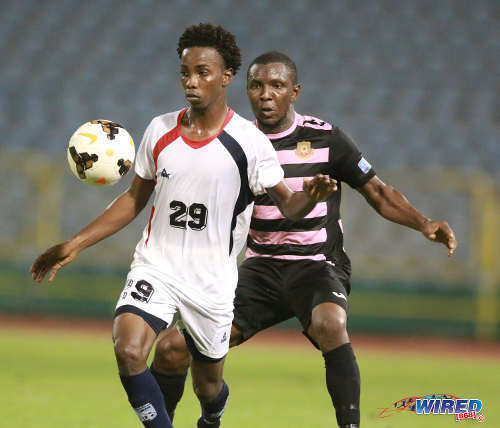 Chike Sullivan replaced Baptiste in the 81st minute and got on the scoresheet within two minutes while Morvant Caledonia substitute Akim Armstrong got a consolation item for the “Eastern Stallions” in stoppage time. The second outfit was not as straightforward, as the two teams with licence to bear arms faced off. Police defender Jibiri McDavid took that licence a bit too literally, though. In stoppage time, as McDavid and Defence Force attacker Hashim Arcia chased the ball in a non-threatening area of the field, the policeman glanced over his left shoulder, where Arcia was closing in, and forcibly swung his left elbow backwards. Photo: Morvant Caledonia United attacker Kareem Knights (left) keeps his eye on the ball with North East Stars flanker Neil Mitchell in close attendance during Pro League action at the Hasely Crawford Stadium on 3 May 2016. If it had happened off the field, McDavid might have been arrested by his own teammates for assault. Referee Marlon Peruse flashed only a yellow card. It was a shocking injustice, even in a period where, as gymnast Thema Williams and cricketer Darren Sammy would testify, there are more than a few of those to go around. By then, though, Defence Force coach Marvin Gordon already had the three points he came for. But it didn’t always look as though he would get them. 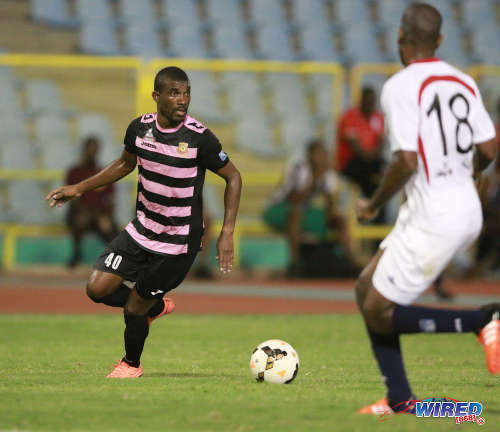 The game was just 13 minutes old when utility player Clevon McFee ran on to a Makesi Lewis pass and calmly slotted past Defence Force goalkeeper Sheldon Clarke to put the “Lawmen” ahead. McFee nearly doubled the lead, four minutes later, as he intercepted a poor clearance from Clarke, only to be denied by an excellent, flying recovery from the goalkeeper. Clarke’s teammates were flying too in the second half, as Arcia brought the Teteron Boys level with a deflected volley that flew past Police goalie Kern Caesar, just one minute and 15 seconds after the interval. Photo: Police FC left back Dexter Alleyne tries to outrun Defence Force flanker Jemel Sebro during Pro League action at the Hasely Crawford Stadium on 3 May 2016. 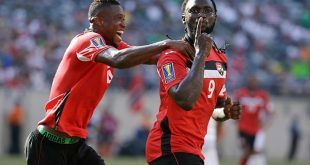 Caesar, incidentally, was filling in for regular number one and Trinidad and Tobago international goalkeeper, Adrian Foncette, who was one of several local winners for a Heineken competition. The winning prize was a trip to Madrid to see Real Madrid face Manchester City in the UEFA Champions League semifinal match today. It may be harder for Pro League advocates to convincingly argue that football fans are unpatriotic for choosing European football our local action when their own players are happy to do likewise. But that is another story. Caesar did a fair job generally but he might have done better for Defence Force’s second item. The Police goalkeeper failed to spot a Ross Russell Jr cross and Jemel Sebro stabbed home on the second attempt from the subsequent goalmouth scramble. 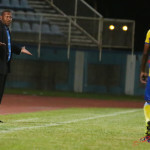 But the ‘Army’ backline was just as scrappy yesterday and a farcical clearance from left back Akile Edwards saw Police pull level in the 66th minute, as the ball hammered off an opponent and spun fortuitously for Jameel Perry to stroke past Clarke. Jorsling made the final impression on the score sheet though, as he was well placed to capitalise after giant defender Glynn Franklin headed down a Marvin Jones corner kick. It snapped a five game barren run for the Army poacher and his squad lost four of those games. 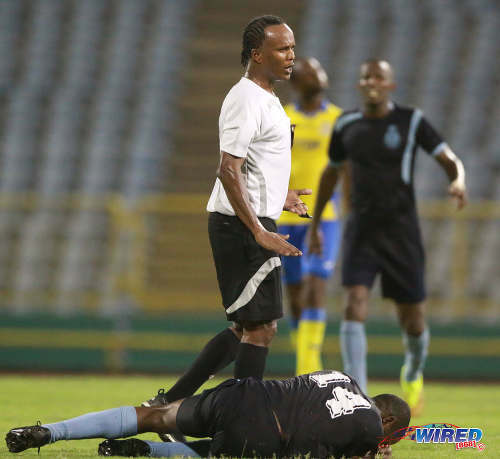 Photo: Referee Marlon Peruse (centre) stands over Police FC stand-in captain Kaaron Foster during Pro League action at the Hasely Crawford Stadium on 3 May 2016. Peruse, who was having a night to forget, took over the show thereafter. Thank God that McDavid’s elbow caught Arcia in the chest rather than across his face. A brawl between Police and Defence Force would have surely bettered Superman versus Batman in Movie Towne. 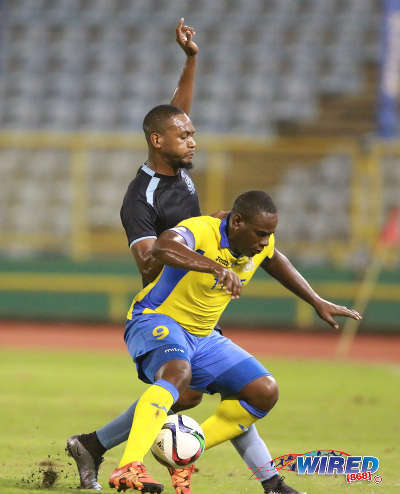 When the dust settled, though, Defence Force, Stars, Jabloteh and DIRECTV W Connection were all within two points of each other with a lone Champions League berth at stake. It is gripping stuff, although Foncette might disagree. Defence Force (4-1-4-1): 25.Sheldon Clarke (GK); 13.Marvin Joseph, 8.Curtis Gonzales, 2.Glynn Franklin, 21.Akile Edwards; 20.Levi Serries (52.Stephan Campbell 85); 12.Jemel Sebro, 11.Akeem Roach (7.Jelani Felix 76), 10.Hashim Arcia, 17.Ross Russell Jr; 9.Devorn Jorsling (26.Richard Roy 81). Unused substitutes: 30.Aaron Enil (GK), 3.Jamali Garcia, 4.Dave Long, 30.Kishun Seecharan. 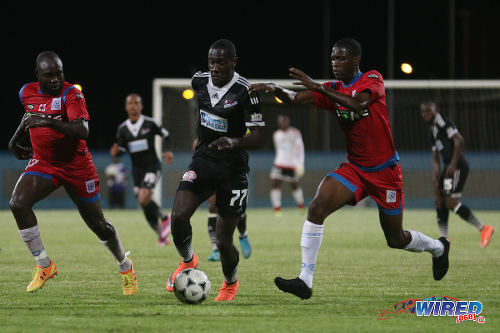 Police FC (4-2-3-1): 28.Kern Caesar (GK); 32.Akile Thomas, 6.Jibiri McDavid, 20.Elijah Belgrave, 17.Dexter Alleyne (26.Kadeem Riley 84); 14.Kaaron Foster (captain), 8.Kurdell Brathwaite (39.Joshua Leach 66); 9.Makesi Lewis, 30.Dylon King, 29.Clevon McFee; 15.Jameel Perry. Unused substitutes: 31.Theon Browne (GK), 2.Jasimar Ashers, 4.Karlon Murray, 5.Anton Hutchinson, 43.Dillon Kirton. In this specific context, I don’t see anything with Foncette’s absence, once the coach permits. Foncette missed the match with or without the permission of the coach/manager/whoever? I’d assume he did have their permission. Not sure if one or two Police fans came out and were bitterly disappointed though. Or maybe not. Lol. To be fair, the replacement goalie was decent. Ok. Well if the club thought it was a good enough reason to miss the match, not sure how we could fault the man. It would be interesting to know whether other clubs would have granted permission given relationships with sponsors and the subvention. But I’m guessing police don’t have any corporate sponsors and don’t get a government subvention per se as the state pays all police officers’ salaries? That’s one point. Wonder how difficult it is to get leave for such stuff as a policeman? Guess that’s another story anyway. Maybe because police really aren’t in contention for a top two finish as well. Kinda hard to tell a footballer to miss a champions league semis match to ensure the team comes sixth or whatever it is in the league. I empathise eh. Great atmosphere. But it certainly ent professional. Like Carlon says, he is a national player. I can understand the lure. But it isn’t professional. So it’s four teams in contention for the second spot? We’re certain Central is going to win? Do we have a betting something going on somewhere in the group? One win needed from three games. Comfortably favourites I think. Actually we do eh. Sherdon Ifm Pierre!